By joining our program, you’ll be able to earn commissions by promoting the Spangler Science Club subscriptions. Club subscriptions can be ordered on a monthly, 3-month, 6-month or annual basis. 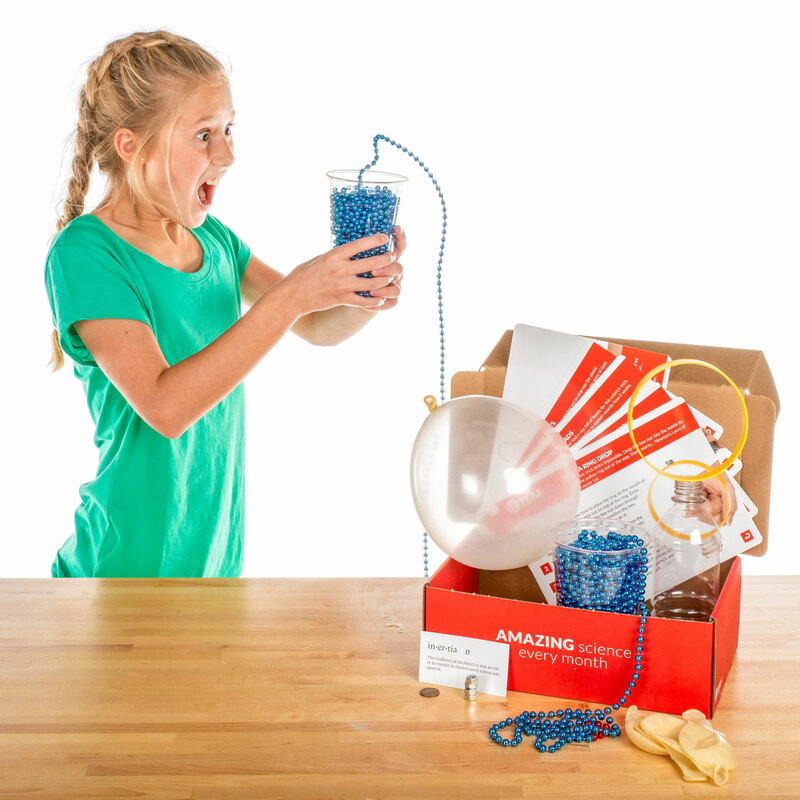 Customers are also able to purchase single kits and hundreds of educational science products through our Science Store. Our club kits make great gifts for birthdays, science camps, before and after school programs, and holidays. Content sites earn $10 for month-to-month, 3-month, and 6-month subscriptions. Content sites earn $15 for 12-month subscriptions. An affiliate program is a service that allows websites and blogs to earn a commission on sales referred to Steve Spangler Science and Spangler Science Club using specific links provided by, and tracked, via ShareASale.com. Our team uploads custom creatives (banners and pictures), text links and product information (datafeed) to ShareASale that bloggers and website owners can add to their websites. ShareASale tracks all clicks from the Spangler banners and text links on your website – so when one of those clicks results in a sale, you earn a commission of that specific sale. For example, if a reader clicks on any of the Spangler banners and purchases a subscription box – you earn $10 for a month-to-month or 3-month subscription and $15 for a 12-month subscription. If a reader purchases $50 worth of products, you would earn $4 (or 8% of the total product sale). Who is eligible for the affiliate program? We accept most types of websites that are relevant to our customer base or products. We do not accept websites that contain inappropriate content. This may include content that we consider to be obscene, harmful or pornographic. Additionally we do not accept websites that contain any viruses, Trojan horses, or any other programs designed to harm visitors or gather their data without their permission. No. It is completely free to participate. What is the commission on each sale? You earn a $15 commission on all 12-month subscription sales. How do I sign up and get started? You must first become a member of the ShareASale Network, which is our third-party tracking and payment platform. You can join both our program and the ShareASale Network in one step by clicking here. If you have multiple websites, you only need to apply once. How do I know if my application has been accepted? You will receive an email with the subject “Steve Spangler Science Affiliate Program Application – Approved”. You will also be able to access our creative inventory by logging into your ShareASale Account and going to “Links > Get Link / Banner”. If you have any questions about your approval status, please contact us at anytime. What images can I use on my website? Please only use images found in our creative inventory on ShareASale. If you are looking for something different, please let us know, and we’d be happy to create a custom creative for you! How do I create links to specific product pages? Sign into your ShareASale Account, click on “Links > Create a Custom Link”. You’ll just need the URL of the page you’d like to link to. You can also follow step-by-step instructions listed on the ShareASale Blog: Can’t Find the Right Text Link? Create Your Own! How does Spangler know when I should receive credit? ShareASale tracks a cookie that is applied to the device of a visitor who clicks on a banner or text link that has your ShareASale Affiliate ID within the link. It’s important that you always use creatives from the creative inventory on ShareASale to ensure each link has your specific ID so ShareASale can properly track clicks and sales from your website. ShareASale will pay your monthly commission on the 20th of each month. Do I receive any discounts? No. You are free to use any advertised coupon codes and you also may purchase your orders through your own links so you can earn commission on the sales. What reports does ShareASale provide? What if I forget my ShareASale account password? If you forget your password, please visit https://account.shareasale.com/a-passwordReset.cfm? We have a 60-day cookie (tracking gap). We encourage you to read our program terms before applying. If an affiliate is caught violating the terms of our agreement we may reverse commissions or remove an affiliate from the program. All sales will lock on the 20th of the month following the month in which the transaction was made. Please include links to all the websites you intend to use to promote our products. Affiliates must not break any laws when promoting products for Steve Spangler Science. This includes compliance with but not limited to: 1. The CAN-SPAM Act of 2003 when sending emails with links to Steve Spangler Science. 2. You should be familiar with disclosure requirements by the FTC. We require all affiliates to follow FTC disclosure requirements. To see FTC guidelines go to: http://www.ftc.gov/sites/default/files/attachments/press-releases/ftc-staff-revises-online-advertising-disclosure-guidelines/130312dotcomdisclosures.pdf. Affiliate websites may not: 1. Contain inappropriate content. This may include content that we consider to be obscene, harmful or pornographic. 2. Contain any viruses, Trojan horses, or any other programs designed to harm visitors or gather their data without their permission. You may not engage in cookie stuffing or include pop-ups, false or misleading links. You may not attempt to prevent the referring page information from being seen by the affiliate networks. You may not place any pay-per-click bids on any terms that include the use of the words or combinations of Steve Spangler, Spangler Science, Spangler Science Club, Steve Spangler Science, Steve Spangler Science Club. You may not link directly to any page at SteveSpanglerScience.com using a PPC campaign. All links must first be directed to the affiliates website. Affiliates may only publish https://www.stevespanglerscience.com coupon codes that are provided through the affiliate program or authorized by https://www.stevespanglerscience.com for use by affiliates, or displayed on our website. Any transactions using coupon codes that we have not authorized by use for affiliates or published on our site will receive a commission of zero. Use of the word “steve spangler science” within any domain or subdomain name by affiliates is strictly prohibited.